Start-ups’ have a high need for all kinds of publicity and media coverage but they generally avoid paid advertising channels. Instead they focus on their own and earned channels. This is no surprise considering typical start-ups’ limited marketing budgets. Conversely, they still value traditional media coverage, especially newspaper coverage. Download your own copy of the infographic here. The infographic findings are based on a summary of six case studies of start-up companies’ media purchasing patterns. Idean prepared the study with Project Manager and Doctoral candidate Timo Ketonen from Åbo Akademi University. In addition to the advertising spending, the infographic looked at the total marketing and communication mix. A typical mix included newsletters, company blogs, press releases, SEO, seminar presentations, social networks as well as coverage on newspapers, magazines, online news and video sharing services. We found that search engine marketing and display advertising stood out from paid channels, although the company’s focus was still on own and earned channels. 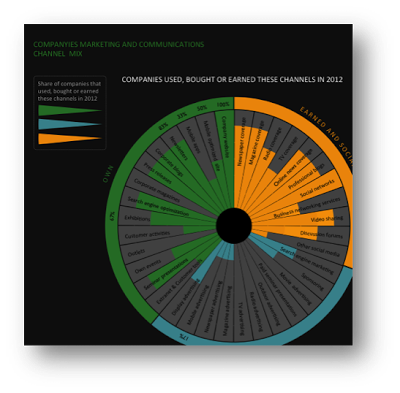 We also asked which channels had the strongest influence on each company’s success. The start-ups were most united on their own company websites and newspaper coverage’s impact on their success. If the companies would have the power, money and time then they would typically focus more on newspaper coverage, company blogs and seminar presentations. All in all, this is again bad news for the traditional media sales executives. If and when these currently young and small companies are one day the wealthy engines of our economy then traditional advertising will not be among the first options in their channel mix. This entry was tagged Åbo Akademi University, communication mix, EDGE, idean, infographic, Media, media coverage, start-up. Bookmark the permalink.